Our praise is pretty irrelevant to everyone and everything but us, those closest to us, and amazingly to God. 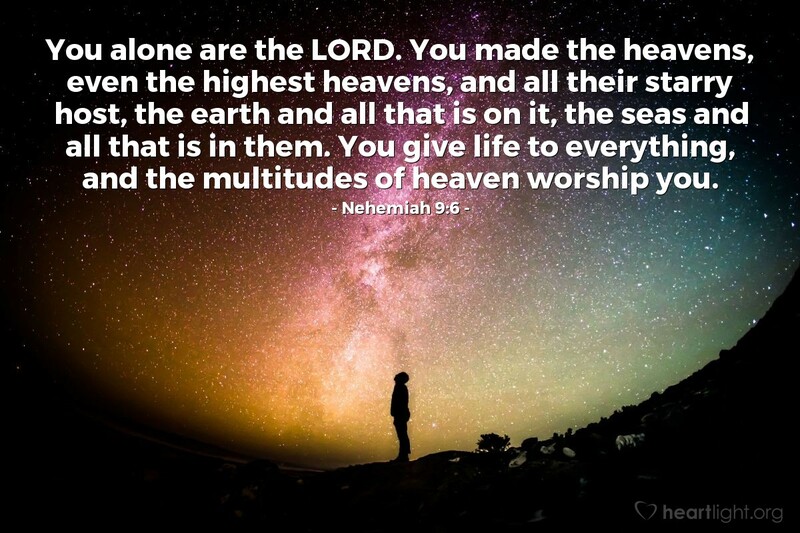 In a universe so vast, so much bigger than Nehemiah could have imagined, what is our small voice and our song of praise? The billions of stars and innumerable creatures of the immense seas all cry out that our Creator is LORD. God will receive the worship of the angels and all the heavenly beings. What difference does it make if we praise him? To the universe, to be blunt, it doesn't matter. But it does to us! It matters even more to the LORD, who longs to be our Father and wants to bring us into relationship with himself. Holy and amazing God, you alone are Lord — Lord of all creation and Lord of my life. You are praised by all you have made. Your works cry out and declare your creative genius and your loving kindness. Father, I want to add my heartfelt praise to the chorus of creation, the voices of the angels, and the praise of many who have come before me. You are truly worthy to be praised. I gladly offer you my words, my songs, my heart, and my life. In Jesus' name. Amen.